Mac and cheese can easily be named as the most-loved comfort food of the world and it truly deserves all the love and attention it has been getting since ages! I don’t think I have heard about any recipe as many times as that of mac and cheese. Mac and cheese seems to be everywhere! Since the time I have started exploring recipes on internet to discover new dishes across the globe (and I am talking about 7-8 years back in the past), the one recipe which had always popped up in front of me was nothing but mac and cheese! You may judge me but honestly, I didn’t have mac and cheese before I even started my blog. Pasta was not a thing for Indian kitchens, so I never had a chance to taste this iconic dish called mac and cheese! Now it has been quite a while that I have started my blog, but mac and cheese was yet to feature here until today! The primary reason of this unprecedented delay was that I was a bit skeptical about the amount of calorie a dish of mac and cheese carries and how the two of us would eat the entire thing! Not that I count calories in every recipe of mine, but mac and cheese undoubtedly tops the chart, doesn’t it? I do love cheesy dishes e.g. I freaked on my cheesy chicken, broccoli and rice casserole which is loaded with cheese too and not definitely a calorie-conscious dish. I agree. It was not only because of the calorie, somehow, I had a feeling that mac and cheese looks too plain and seems like something is missing in there. I can shamelessly admit now that I was utterly wrong! Comfort food becomes comfort food only because of its simplicity! When a simple dish can give immense pleasure to your body and soul, only then it can get into that level of comfort where mac and cheese is today which a naive me failed miserably to understand! After watching zillions of mac and cheese recipe videos and reading through a few more printed recipes, I finally zeroed in on the chef John’s version of mac and cheese where he used panko breadcrumbs which is a very clever trick to add a kick of crispiness to the ooey-gooey mac and cheese. And we loved that crispy kick along with the hint of spice lend by paprika (or cayenne pepper in case you want to make authentic chef John’s version!). 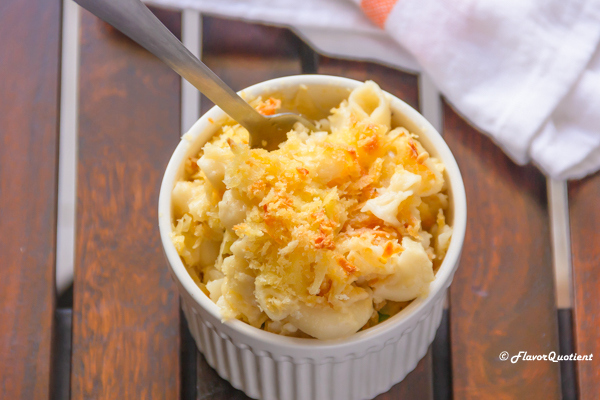 So, you don’t be a naive like me and make this mac and cheese today to understand what comfort food really means! Cook the macaroni in heavily salted boiling water but cook it for couple of minutes less than the time mentioned on packet instructions since we will bake the macaroni in the oven for good 20 minutes. Drain and set aside until needed. Heat a sauté pan with high sides. Add the unsalted butter to it and let it melt keeping the heat on low so that butter doesn’t burn. Once the butter is completely melted, add the all-purpose flour and whisk it continuously to avoid forming any lump. Cook the flour for couple of minutes on low flame until the raw smell is gone and it turns light golden in color. Add the dried thyme and paprika or cayenne. Give a good mix. Next add 1 cup of milk and whisk thoroughly. Do not add all the milk in the beginning as it may become difficult to whisk and break all the lumps which the flour will form. Whisk generously so that all the flour is dissolved and the sauce becomes smooth. As the milk comes to boil, sauce will start to thicken. Then add rest of the milk. Stir through using a wire whisk or spatula. Let the sauce come to a boil. Add the nutmeg and Worcestershire sauce. Mix. Now it’s the time to add the grated cheese. Add 1 cup of the grated cheddar cheese. Gently stir them in. Cheese will take about 5 to 7 minutes to completely melt into the sauce. Add another 1 cup of grated cheddar cheese and half a cup of grated mozzarella. Mix well. Season the sauce with salt to taste. The sauce would be nicely thick by now making it a luscious and smoothest cheese sauce ever. Switch the flame off and start assembling the mac and cheese. 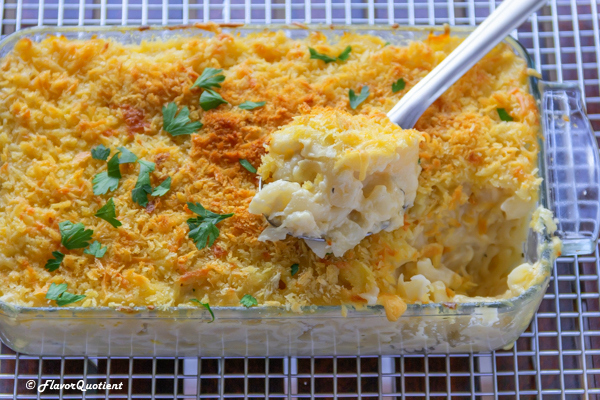 Take a deep baking pan and add the cooked macaroni. Then pour the prepared cheese sauce in 3 installments mixing it thoroughly after each addition. Make sure each macaroni is coated with the cheese sauce. 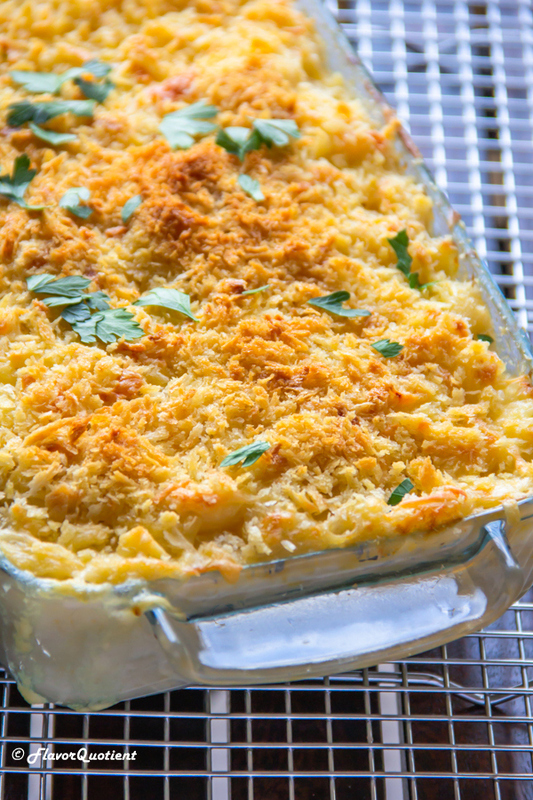 Smooth out the top of coated macaroni to create a flat surface for the remaining grated cheese. Sprinkle remaining 1 cup of grated cheddar cheese and half a cup of grated mozzarella all over covering the top of the coated mac. Finally, sprinkle the panko breadcrumbs over the grated cheese covering top surface completely. Drizzle the melted butter on top for a beautiful golden crust. Preheat your oven to 200 C / 400 F and bake the assembled mac and cheese for 20 minutes or until the breadcrumbs turn golden on top and the sauce bubbles below. 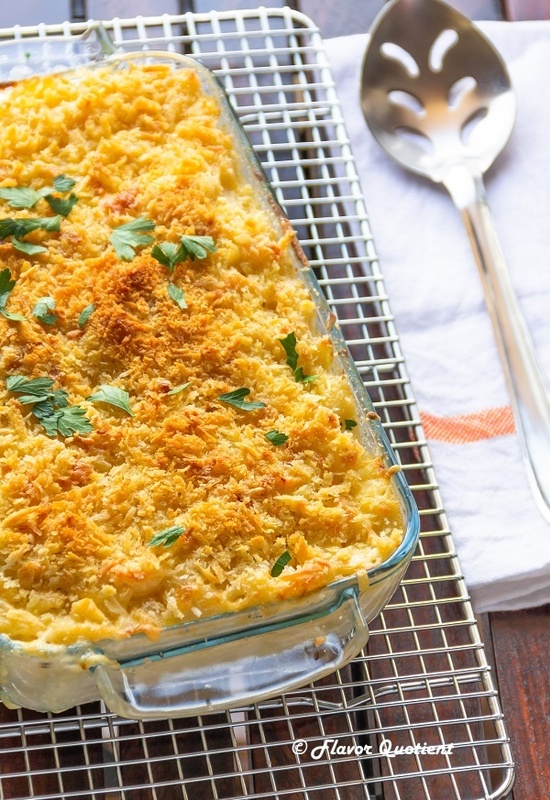 Serve the warm mac and cheese and enjoy the world’s most loved comfort food!